Have you ever wondered why your body’s energy and mood can fluctuate so often during the day? While our hormones and diet play a huge part, the impact of observing Circadian rhythms is further exemplified through a map Traditional Chinese Medicine offers us to explain how our organs and energy meridians are linked throughout the day. The Human Body Energy Clock, otherwise known as the Chinese Body Clock, is based off Traditional Chinese Medicine’s (TCM) explanation of Qi (life force energy) and how it moves through each organ at specific times during the day. Every two hours the energy moves to a different organ, indicating its energetic peak. Based on the clock, you can then understand that whichever organ is at its peak, the organ opposite (12 hours ahead) is therefore at its lowest energetic functioning. This 24 hour clock allows us to understand when and why it’s ideal to exercise, eat, make love, rest and sleep. Each organ also has an an element associated, with characteristics/emotions that directly correlate so we can better understand discomfort felt on a physical and emotional level. Being aware of this clock will allow you to act more in alignment with your body’s natural rhythms through each phase of the day. As you end your sleep cycle, the body should be kept warm to create ease on the lungs as the body is replenished of its oxygen. Deep breathing will serve your nerves and set you up for that morning exercise. Morning is also the ideal time to do presentations since your lungs capacity is closer to its peak. The morning is the optimal time to honor your large intestine’s daily elimination, as toxins from the day before should be cleansed in multiple forms. This includes washing your body and starting the day off with lots of water for a fresh start. Lay off the caffeine and go for a walk instead. If you can make breakfast the biggest meal, this is ideal to optimize digestion and absorption for when this food moves to the small intestines to be further processed. Cooked whole foods high in fiber, protein and healthy fats are best. The time when your natural enzymes are used to metabolize food, creating energy for the rest of the day. TCM believes the spleen to be the most critical digestive organ as it makes antibodies to ward off infection while also monitoring our blood for intruders. A perfect time to get your day going with work or exercise you would ideally like to do your most demanding tasks at this time. Mid-day we can expect this organ to show our body some love as nutrients are pumped throughout our system to assist with sufficient energy and nourishment. The best time to eat a light (again preferably cooked) lunch while connecting with those around you. A cup of tea and a short nap might also serve you well during this interval. By this time, food eaten earlier in the day will finish its digestion and assimilation while lunch is still being digested. You can take this time to sort out issues and get organized as your body does the same. Your liquid metabolic waste is now being prepared in the kidney’s filtration system for release. An optimal period for more mentally-challenging projects/studying. More tea or water is also encouraged to continue a smooth detox process. Peak time of blood purification as your kidneys create chemical balance while storing energy reserves. It’s important to note the adrenals work with the kidneys to provide cortisol, which provides energy for our morning when kidneys are functioning at their lowest energy. At 5:30 you also reach peak cardiovascular efficiency and muscle strength. A light dinner coupled with exercise will assure circulation is maximized before you sit and relax for the evening. The days nutrients are now being expelled to the capillaries and cells of your body. Your blood pressure is at its highest at 7:30 so a massage, stretching or reading will signal your system to relax and enjoy this process, while telling the mind to take a break. The Pericardium is also responsible for our reproductive organs signaling this as the optimal time to make love or conceive. Also known as the Triple Burner in Chinese Medicine, this three part system governs the blood vessels and arteries while controling the flow of fluid throughout the body. Our endocrine system works to create equilibrium while enzymes are being replenished. This is the easiest time to start sleeping for the body to properly restore and replenish energy for the morning. Bile is currently being released to aid in fat absorption as you rest in preparation for morning. Chinese medicine indicates yin energy ebbing and yang energy increasing as we lay to rest. This yang energy will be stored while you sleep and activated once you wake and begin your day. As you sleep, your liver is at work storing and cleansing your blood. Toxins are expelled and new blood is supplied. Trouble sleeping could be attributed to improper liver function or polluted detox pathways along with an excess of yang energy present. This makes eating light and early essential for proper nighttime liver performance. 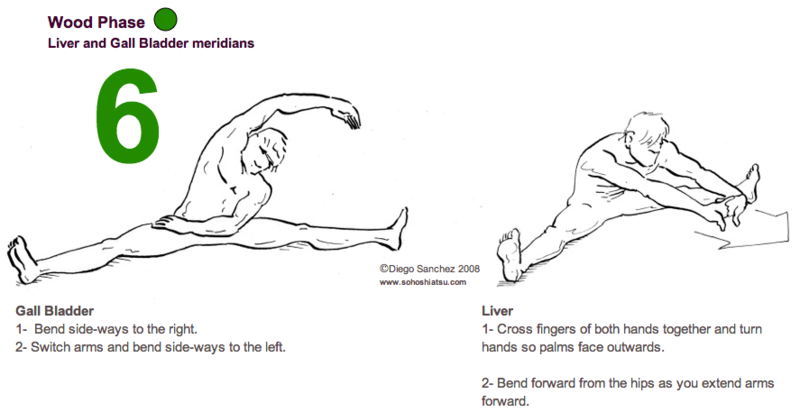 The traditional Chinese Makko-Ho stretches are great for opening up the 6 pairs of meridians, enabling Qi to flow with greater ease through the body. 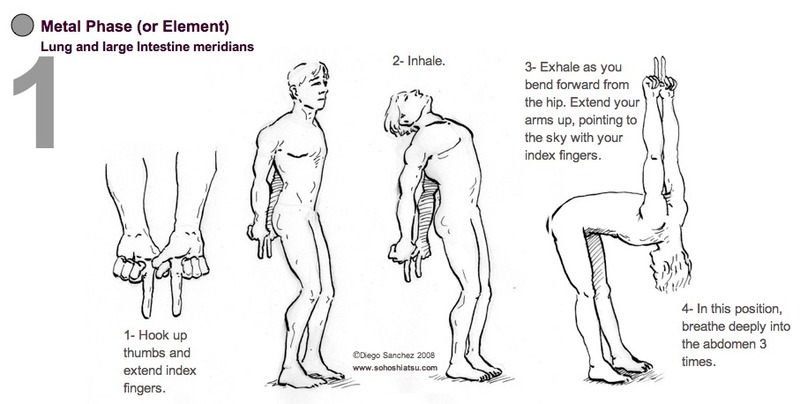 Try becoming more aware of your routine based on your body’s cyclic nature along with these stretches and let us know how you feel!